The Central and the State Government departments and agencies, on the basis of manpower requirement therein, engage various sets of workmen other than permanent employees viz. 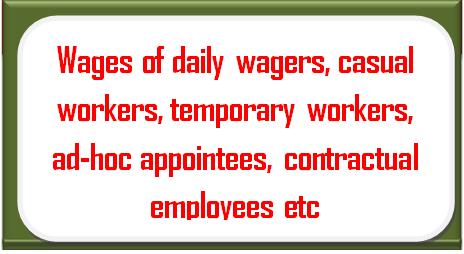 daily wagers, casual workers, temporary workers, ad-hoc appointees, contractual employees etc which are engaged by an establishment directly or through contractors. 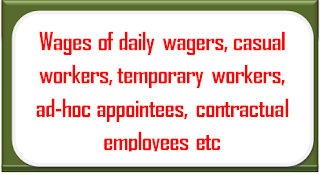 The wages, terms & conditions of service and the period of engagement of such workers in an establishment varies from establishment to establishment. Data in this regard is not centrally maintained. It is mandatory for the employer/principal employer to comply with the various statutory provisions/Court Orders/Government Instructions including instructions on wage related issues of various categories of employees and apply the principle laid down by the Hon’ble Supreme Court regarding “equal pay for equal work” while paying wages to its workers/labourers. The instructions regarding equal pay admissible to casual workers already exists in terms of Department of Personnel & Training (DoPT) O.M. No. 49014/2/86 Estt. (c) dated 07.06.1988. In order to ensure compliance of labour laws and in this regard, there is separate enforcement machinery available in the Central and the State Sphere to which an aggrieved worker can approach for redressal of its grievances. In the Central sphere there is a well-established Central Industrial Relations Machinery (CIRM) having country-wide network of Dy. Chief Labour Commissioners (Central) and Regional Labour Commissioners (Central) under the control of the Chief Labour Commissioner (Central) for enforcement of labour laws and redressal of grievances/settlement of claims arising out of labour disputes.